Earlier in the year, in May, a beam shaping, multi-spot optical module developed by Laserline, Scansonic and Volkswagen won the €10,000 Innovation Award for Laser Technology at the International Laser Technology Congress AKL in Aachen, Germany. The triple-spot module not only delivers tailored spot geometries, but also offers adjustable power distribution and distance between the spots. The device has been demonstrated to enable higher quality and more cost-efficient joining with diode lasers in industrial mass production. The work is an example of how beam delivery technology can solve industrial laser problems, and increase the speed, quality and robustness of processes. The triple-spot module was developed to address an issue identified by Volkswagen after the firm switched from using electro-galvanised steel to hot-dip galvanised (HDG) steel sheets in the bodywork of its vehicles – HDG is more corrosion-resistant and cost-efficient. The issue was observed with the laser brazing process used to join galvanised steel sheets, which didn’t produce the seam quality Volkswagen required. Thanks to the new surface properties of HDG sheets, not only did the quality of join decline from that usually expected from laser brazing – becoming rougher and often showing ‘wavelets’, in which the solder has exceeded the intended joint – but spattering also occurred close to the joint, which while barely being visible initially, became clearly visible after painting. Following Volkswagen’s request for a solution to the problem, Laserline, through several iterative tests and in close cooperation with the automotive firm, developed an optical module that produces a multi-spot geometry consisting of three spots: a main rectangular spot with two smaller spots positioned in front. The module was integrated into Scansonic’s existing ALO3 brazing optics. 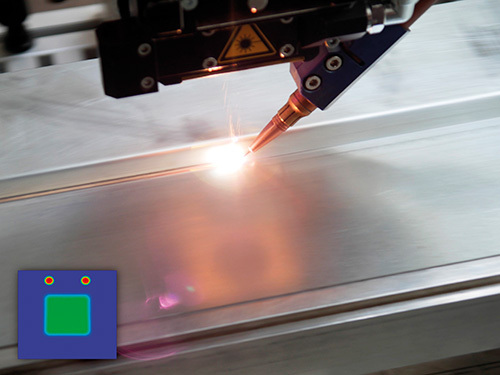 In laser brazing, laser radiation is guided through a fibre to a set of working optics, which are moved along the joint by means of a robot. The laser melts a copper-silicon wire fed into the process. For Laserline’s triple-spot module, the front spots are used to ablate the galvanisation at the edges of the brazed seam, while the main spot melts the brazing wire, directly following a separate process, and creates the joint. During the iterative tests it became clear to Laserline that having a variable power distribution between the different spots would be key to achieving the optimal process parameters for brazing, especially across the different joining geometries of a car. It was also requested after a period that the power distribution between the spots also be adjustable in real time during – rather than before – the brazing process. ‘This would make it possible to process different seams on the car body in one pass with the same brazing or welding optics,’ Dr Axel Luft, sales manager of global automotive at Laserline, explained. Luft collected the award at AKL along with Dr Markus Baumann, Laserline’s optics developer. ‘This requirement led to a complete overhaul of the optics module mechanics, in which a drive with closed loop control was integrated into the module via brushless servo motors,’ Luft continued. The triple-spot module was therefore designed with real-time variable power distribution between the main spot and secondary spots, as well as between the right and left secondary spots, with the adjustments being made by a robot. The module also makes it possible to switch off the secondary spots during brazing, or the central spot during welding. ‘After the first successful tests on sample components, it soon became clear that exact reproducibility of spot positions and power distribution would [also] be decisive,’ commented Luft. ‘Therefore, there was a demand for a measuring device with which module parameters and defocus offset could be set.’ Luft and his team added a camera to the solution, which was placed under the brazing optics in order to set the parameters and provide all the relevant information. ‘We found an optical solution that can generate the required spot geometry, offer a high degree of flexibility to enable a variable power distribution, and to change spot distances by setting a defocus offset value,’ Baumann added. Proving effective at optimising the brazing process, Laserline’s optical module is now the preferred solution for brazing hot-dip galvanised steel sheets at Volkswagen, with more than 60 ALO3 optics equipped with triple-spot modules having already been ordered to braze HDG material. In addition to brazing, the module was also demonstrated to improve welding applications, again after being integrated into Scansonic’s ALO3 tactile head. The module was also shown to improve the shape of the cross section of a weld by adjusting the power distribution between outer and inner spot, according to the team, with it now being possible to shift approximately 70 per cent of the whole laser power between inner and outer spot via a robot for each weld during a cycle. Several OEMs and suppliers are now testing and qualifying the new multi-spot solution at the moment, according to Luft and his team, with promising results having already been achieved in tailored welded blanks, battery housings and in powertrain gearwheel welding. It’s not just Volkswagen that’s pushing laser equipment suppliers to innovate, but also Daimler. At this year’s European Automotive Laser Applications conference (EALA) in Bad Nauheim, Germany, in February, Christian Dini, the director of global business development at Ophir Photonics – alongside Daimler’s Dr Andreas Bünting, responsible for process engineering for machining with lasers – presented a lightweight, non-contact beam monitoring solution that had been specified by Daimler and developed by Ophir to increase the rate and ease of beam inspection. The solution, known as BeamWatch Integrated, is an adaptation of Ophir’s pre-existing BeamWatch technology that can be used in a fully automated production line. Daimler uses beam monitoring systems to ensure lasers for welding differential gears are aligned and the focal spot is in the correct position. Traditional beam profilers were previously used for such applications, according to Dini. However, these were difficult and time consuming to use, which typically led to only one beam measurement being made per shift. Also, they interfered with the beam to take a measurement, meaning they could potentially alter the beam in the process. Combined, these characteristics did not make such profilers suitable for the high-throughput production environment of an automotive factory. Process gases and stray particles in laser work cells can degrade the coatings on optical elements, causing them to warm up and change shape. In addition, when using a fibre to deliver a beam, continuous back-and-forth bending of the fibre during processing can lead to it becoming misaligned. Both can cause a shift in the focal spot position of the beam, which changes the weld's properties. Dini explained: ‘If the focal spot moves along the z-axis at all then the power density and spot size on the weld surface changes. This can lead to a hole being drilled if the focal spot is driven too deeply into the material, rather than a successful weld taking place. ‘The other effect would be not having enough power density, so the melting spot in the keyhole might not be as one would expect. This can make the welding join weaker,’ he added. BeamWatch is an 8kg non-contact beam analysis system that does not need to interfere with the beam in order to take a measurement. Rather than generating a beam profile, it gives an almost real-time video signal of the beam caustic around the focal spot location. In collaboration with Fraunhofer ILT, Coherent has recently released a 248nm 150W LineBeam system that enables fast and precise short-UV processing in applications ranging from surface illumination and modification to ablative structuring and large area patterning, across a wide range of materials. With it, materials with a depth resolution below 0.1μm can be modified, and users can structure sensitive multilayer systems selectively without causing thermal damage. According to the collaborators, the system provides the technological basis for developing new products with innovative coating functionalities, and opens up access to the fast production of two-dimensional functional layers on large areas. By using a fixed line beam with nanosecond pulse duration and combining it with a 248nm 150W excimer laser as the beam source, the team has created a system with high throughput and optimal reproducibility of the resulting layer modification. The 248nm wavelength is suitable for many emerging applications such as laser lift-off separation of micro-LEDs from their sapphire wafers, cleaning carbon fibre reinforced plastic surfaces, and the 248nm-mediated formation of graphene films from graphite oxide. The beam projection design of the new system provides a high 1.2J/cm2 fluence in the substrate plane, a beam size of 155mm in length, and at the same time a high depth of focus of +/-100µm, offering the large process window for area treatment. The main challenge in achieving this beam delivery, according to Delmdahl, was to come up with an optical beam path design where all optical components are capable of withstanding the 248nm photons at a high UV power level of 150W and operate within specification for years. ‘In order to ensure the system’s longevity, we exclusively employ selected high-quality substrate and coating material for all of the optical components,’ Delmdahl said.